And so she did. At 61, Young departed for Indonesia where she was among the first group of Peace Corps Volunteers to return to the country in more than 45 years. Young spends time with her grandchildren. As an education Volunteer, Young spent 27 months teaching English in high schools and facilitating English camps for hospital staff and community members. 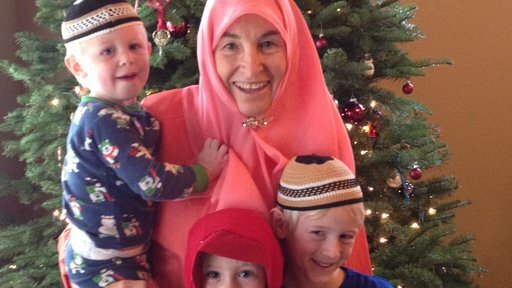 From meeting new people to immersing herself in a distinct culture, Young’s service defined her post-retirement life. And her experiences as a mother helped her in unexpected ways while serving. She empowered her students and educated them about American life and culture. Motherhood didn’t stop just because she was thousands miles away from home. Her daughter found the time to visit her while she was serving in Indonesia and together, they forged memories that would live beyond their time in service. Young with her students in Indonesia. “Being returned Peace Corps Volunteers has bonded me and my daughter more. She likes to tell my grandchildren about the adventures we had: the way we squatted on the floor to wash clothes in a little basin and the rice we ate three times a day,” Young said. But Young isn’t the only mother who was encouraged by her family to join the Peace Corps. Mary Haugen’s children also cheered her on from the sidelines when she announced that she would be joining Peace Corps Ukraine at the age of 65. 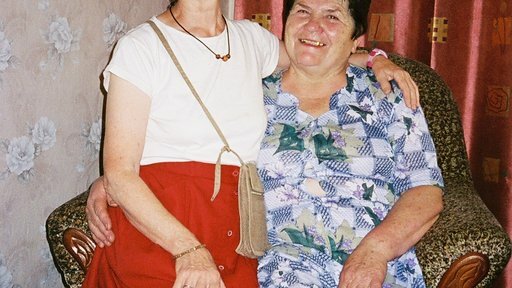 Mary Jane with her host mother in Ukraine. Though Haugen had preconceptions about what it would mean to serve as a Peace Corps Volunteer later in life, it was a challenge she had always wanted to conquer. And to her surprise, her age didn’t hold her back while she was in service. “I think retired people can find so much joy in going around new corners. Learning a hard language, working with different mindsets, and seeing a new angle on history, all inspire growth,” Haugen said. While working as an English teacher from 2003-05, Haugen collaborated with fellow Volunteers and members of the community to improve the quality of education in schools. She also worked at summer camps and helped students after school with their English. Service allowed Haugen to complete a lifelong dream, one that she had put on hold time and time again. And looking back, she is convinced it was one of the best decisions she ever made. “Who could ask for more than a place with a job, co-workers, neighbors and new experiences every day? I'd encourage all those considering the Peace Corps to go for it,” Haugen said. “You're not going to get any younger."